In this case, that genius was legendary architect Frank Lloyd Wright, who had begun experimenting with concrete block back in the 1920s. “His first prototypes [for concrete block houses] were in California,” notes Bruce Brooks Pfeiffer, director of archives at the Frank Lloyd Wright Foundation. Wright referred to his experiments as “textile block” construction—“think of warp and woof in weaving,” says Pfeiffer, who also notes that Wright’s goal was to develop a building process that did not require skilled laborers, and therefore was less costly to implement. 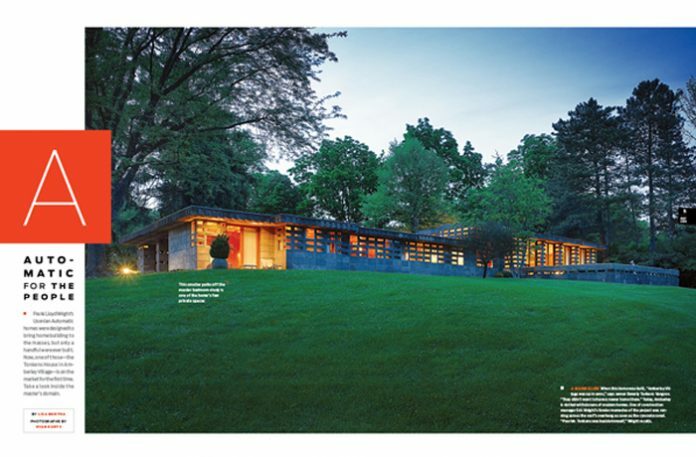 Wright eventually came to describe this less expensive way of building as “Usonian,” and although his first official Usonian structures were built with wood as well, the rising costs of carpentry following World War II led him to revisit the concrete prototype. This time, Wright went one step further and developed a building system called “Usonian Automatic,” which was akin to a life-sized concrete Lego kit. These homes were theoretically simple enough to build that homeowners could construct them alone, without the help of skilled laborers, thereby driving the cost down even more. “The homeowners made the blocks, and they participated in the building of the house,” says Pfeiffer. When they met, the story goes, Tonkens showed Wright some preliminary plans for a home on an Amberley Village hillside site; they had been drawn by one of Wright’s former students. When Wright, then 86 and a known egotist, saw them, he “flipped them into the fireplace” with his cane, says Tonkens Vangrov. The Tonkens house is the only construction project Eric Wright supervised for his grandfather before leaving to work for his own father, Lloyd Wright; he admits that the concept worked better in theory than in practice. “Unfortunately, the blocks were handmade, so they didn’t come out exactly equal,” Wright says. “So at the end of a course of 20 or 30 blocks, you could be a quarter-inch off in elevation. You had to keep shimming them.” Which could explain why the Tonkens house—under Tonkens Vangrov’s care since her husband’s death—is just one of a handful of Usonian Automatics ever built. Still, Wright adds, “it definitely is one of his finest concrete block houses. They maintained it well, it was beautifully built, and it has wonderful proportions.” In other words, it’s a truly concrete example of what can happen when the right client meets the right architect at exactly the right time. See a gallery of images from this home. Originally published in the July 2013 issue.